The findings of four friends who graduated from Iowa State University with degrees in AWESOME. I'm a little tired of waiting for the zombie apocalypse. It's been more than 40 years since George Romero promised it, and all we've gotten out of it are some incredible films and books surrounded by a lot of really crummy knock-offs. In the last decade, particularly, zombies have been all over cinema screens. For every Shaun of the Dead or Dawn of the Dead remake, there seem to be 7 awful indie zombie flicks out there too. They're even invading our TV sets, thanks to the upcoming The Walking Dead series on AMC. So when the fellow behind this book - Dr. Dale's Zombie Dictionary - got in touch with me about a review, my instant mental reaction was to wonder if we really need more zombies. I mean, if you've seen a handful of the myriad of z-films (or read any zombie literature), you probably have a pretty good understanding of them by now. What more is there to offer? 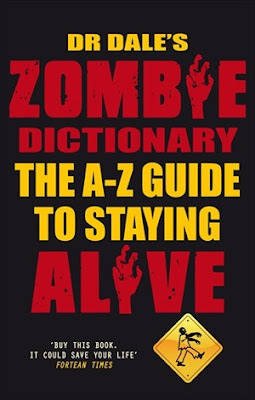 Can a Zombie Dictionary released in 2010 really sustain itself and not become a one-note joke you've already heard? I'm happy to say that yes, it can. Because Dr. Dale's Zombie Dictionary is a very, very fun read. It seems to me that Dr. Dale - if that is his real name - has a pretty good understanding of how saturated the zombie market is right now. He arms himself with this knowledge, and parlays it into an understanding that most people that would be interested in this type of book already know the basics. With this in mind, he focuses on things you might not have considered about the zombie apocalypse, and keeps things light. For example, I've certainly never considered how the Utilitarian Furniture Mart known as IKEA might play in to the zombie apocalypse. Dr. Dale has. I've never given much consideration to how pixies or "Spiderman Zombies" might or might not come into play, but he has. Dr. Dale covers a lot of things that I have occasionally considered, but gave me new info on them, too. For example, whether or not I'd wear a helmet whilst fighting zombies has crossed my mind, but Dr. Dale's reasoning about helmets took my breath away. I was mostly laughing while losing that breath, but that's the charm of the book. It makes sense along with zombie lore (making sure to reiterate the fact that running zombies don't exist), but has a lot of fun with how to deal with the undead. In a time when George Romero is up to SIX Dead flicks, we need to maintain a bit of comedy about the topic to keep it fresh. He also peppers in some hilarious analogies using pop culture. Some of it is very British humor, and I may have been a little to yankee to get all the gags entirely, particularly when he talks about London's road planning. It's also worth noting that the book is very up to date, referencing last fall's Zombieland and plenty of recent pop culture names. Dr. Dale's trying pretty hard to give us a lot of entertaining information here, and some of the topics in the 300+ page text do fall flat. But the book still provides a lot of laughs, and there are plenty of truly interesting ideas inside the book too, including how Freud's idea of the Id might come into play. Maybe it won't invade your psyche too deeply but, if nothing else, the book will come in handy to lighten the mood while you're dealing with zombies. If you're reading this blog, you probably have a decent understanding of what you need to do when there's no more room in Hell. But Dr. Dale has most certainly considered some things you haven't and his method of sharing them works well. I highly recommend it. If you want more info about the book, check out the official website here. And, if you like, you can pick up your own copy at Amazon. Narcosleepy - Pretty much the smartest guy in the world. Specializes in sleeping, toys, Transformers, Sci-Fi movies, and psychology. The H-Bomb - The viciously awesome woman who controls Narcosleepy. (They're married and stuff.) 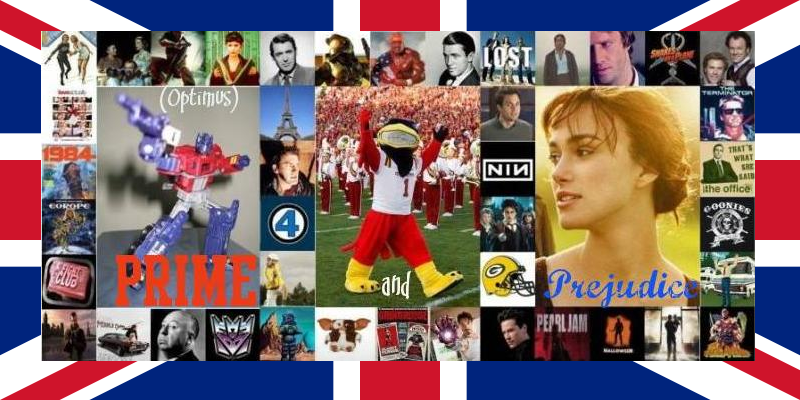 Specializes in Jane Austen/chick flicks, pop culture, travel, and all things Iowa State. chev chelios (dana)- when he's not setting his AC to "blow midget down hallway speed" he enjoys: movies, gaming, music, traveling, hangin' w/the OP&P crew and quoting screen legend Arnold Schwarzenegger. The Mike - Midnight movie blogger by night, follows these three around by day. Specializes in watching horror movies, collecting DVDs, loving sports and the Green Bay Packers, and feuding with The H-Bomb. If you'd like to contact the staff of (O)PP, email us at primeandprejudice@gmail.com! (Optimus) Prime and Prejudice by http://primeandprejudice.blogspot.com/ is licensed under a Creative Commons Attribution-ShareAlike 3.0 Unported License.